Traditional Filipino Weapons — The Highest Quality Steel On The Market. All the blades are an alloy made of 5160/D2 blended steel. The heat treatment is a sodium nitrate treated and tempered to 58~60 on the Rockwell hardness scale. That is close to the hardest you can get any steel without brittleness setting in. It is the same hardness as an original Japanese Katana. These Swords can easily chop through a cow’s head with minimal effort The knives can easily go through a car door. No one has this quality in craftsmanship and durability here in the US for Filipino bladed weapons. 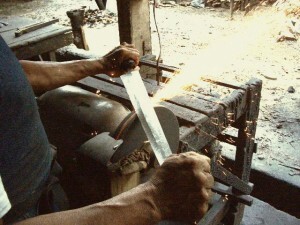 Many swords and knives you see sold in martial art, gun or blade magazines are stamped out and sharpened then polished. TFW bladed weapons are all individually hand made. You will never find anything like it with both, this kind of craftsmanship along with such high quality steel. Also take note that these blades are made the ancient traditional ways, and will not break or fall off guaranteed! About TFW Handles and Sheath Materials — Antique Quality Historically Accurate Weaponry. The exotic woods used in the handles and sheaths of our Traditional Filipino Weapons make them even more special! Narra and Molave, as well as Gijo Iron Wood are regularly used in the handles of the TFW Products. Knives and smaller blades incorporate Kamagong Iron Wood. Sword Canes and some of the newer Moro blades use exotic Adaan. The sheaths for the Traditional Filipino Weapons are individually hand crafted and fitted from Red Pine wood which is light, flexible, and adapts to climate changes so that the sheath fits the blade for a lifetime! They are all individually hand made by a people in the Philippines the same way these expert blacksmiths have been making them for centuries in that area. Each generation improving on the way the last generation made them. Every one of these Filipino historical and cultural weapons are actually combat ready to cut through just about anything! You can see by reading the information on each blade, that they are not made of re-melted spring steel like many other weapons from the Philippines on the tourist market today. We Guarantee, you will not find this kind of high quality steel blades from the Philippines anywhere else but right here on the TFW web site! The exotic woods used in the handles and sheaths of our Traditional Filipino Weapons make them even more special. Iron woods like Adaan, Kamagong, and Molave, as well as Gijo Iron Wood are regularly used to make the handles of the TFW Products. Knives and smaller blades incorporate Kamagong Iron Wood. Sword Canes and some of the newer Moro blades use exotic Adaan. The sheaths for the Traditional Filipino Weapons as well as the other ancient cultural bladed weapons are individually hand crafted and fitted from Red Pine wood which is light, flexible, and adapts to climate changes so that the sheath fits the blade for a lifetime. I’ll explain further what is going on with our production. “Explaining further about my production methods: The next process is the involvement of gas. This is called gas carburizing. Gas carburizing is accurate control of the process temperature and carburizing atmosphere. The components are brought to a uniform temperature in a neutral atmosphere. The carburizing atmosphere is introduced only for the required amount of time to ensure the correct depth of case. The carbon potential of the gas can be lowered to permit diffusion avoiding excess carbon in the surface layer. Gas carburizing uses a gaseous atmosphere in a sealed furnace usually containing propane (C3H8) or butane (C4H10). Sometimes the generated carbon dioxide, water vapor, and oxygen are controlled at low levels by purifying using activated carbon filters at high temperatures. An alternative carburizing atmosphere is sometime generated by using a drip feed system by feed an organic fluid based on methyl , ethyl or isopropyl alcohol + benzene or equivalent is fed into the carburizing chamber at a controlled rate. In this process there are generally internal fans working to ensure an even gas in the chamber. In the improvised chamber in my factory I have installed old electric fans inside just to keep the gas balanced. After carburizing, the work is either slow cooled for later quench hardening, or quenched directly into various liquid quenches. “The special process of quenching and gas carburizing is what sets us apart from ordinary blade making. Considering the length of every sword and considering the shape as well, we cannot and no longer grind the long swords of Kampilan into it’s “thinnest edge”. The length of the Kampilan is too long for blade-thin grinding, and therefore doing so would either break the edge, chip the edge, or worst, crack the parts of the swords.